The appointment went well today. Both babies are measuring right on track. Baby A was measuring exactly 8 weeks with a heart rate of 175. 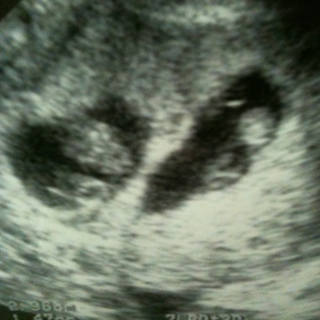 Baby B was measuring 7w6d with a heart rate of 161. Everything looks great and we are so thankful! They've grown quite a bit in 2 weeks although Taylor still thinks they look like "blobs". We have another u/s on August 8th and if all is well, we will graduate from the RE office and be under the care of an OB/GYN. More good news? No more PIO shots! Although I still have to do the Endometrin vaginal suppositories for another 2 weeks. I haven't mentioned those on this blog yet and they're about as fun as they sound. But at least they don't involve a long needle. So far, so good. We aren't taking one single day of this for granted. yay, that is all so exciting (except for the suppositories...but who can complain when you have two babies in the oven??)!!! i'm so happy for you!